Featuring chapter contributions from: Brian Clark, Jay Baer, John Jantsch, Kim Garst, Sonia Simone, Donna Moritz, Denise Wakeman, Barbara Rozgonyi, Brian Dean, Syed Balkhi, Eric Ward, Andrea Vahl, Beth Hayden, Lou Bortone, Viveka von Rosen, Stephan Hovnanian, Jason van Orden, Sue B. Zimmerman, Bob Baker, Kim Dushinski, Ian Cleary, and Craig Valentine. Eager business owners gain access to the playbooks of 23 of today's most respected and well-known online marketers, who reveal their most valuable online strategies and tactics for capturing new customers and influencing ongoing purchases from current ones. Each chapter is a coaching session designed to help business owners avoid the pitfalls and mistakes by the experts who have been there and done that. 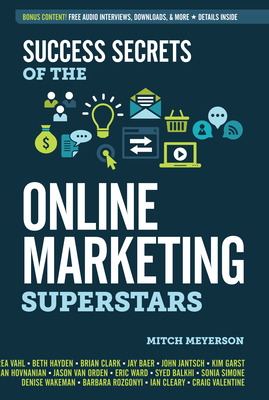 Readers learn how to develop a personal media brand, build a total online presence, and create a social media strategy that increases traffic. They also discover how to develop and use content that converts visitors into buyers and ultimately loyal customers, succeed with SEO, pay-per-click, and linking strategies that get websites ranked. Also included is information on leveraging social networking apps, including Facebook, online video, and Instagram, and avoiding the mistakes made by new online businesses. Mitch Meyerson is the author of 11 books, including Mastering Online Marketing and Guerrilla Marketing on the Internet. He has been a featured expert on Oprah and has trained and certified more than 600 coaches in his acclaimed Guerrilla Marketing Coach and World Class Speaking Certification Programs. He lives in Scottsdale, AZ.